At about the same time as dinosaurs roamed the earth, magnetic tape was the hottest way to store recorded audio.Naturally, cave men discovered that starting and stopping the tape while playing back would lead to interesting effects. 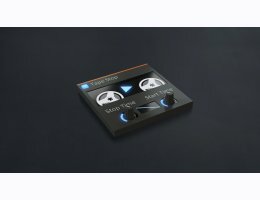 kHs Tape Stop simulates this arcane technology in a simple way, allowing you to get great spindown/speedup sounds quickly with the push of a button. What's next? Harnessing the power of fire?